Slip and fall accidents are one of the most common accidents in any workplace. Help prevent these from happening with Slippery Floor Signs. Many facility operations regularly use various liquids in their processes. Whether these be oil, dyes, hydraulic fluids, ethylene glycol, or plain water, once these industrial fluids spill on your facility floor, a potential slipping hazard is created. And while you may abate these hazards through various methods of floor treatment, nothing beats a good old fashioned wall-mounted safety sign to inform your workers of these conditions. Besides wall-mounted signs, floor stands signs are also a great safety equipment to use in the event of a spill. 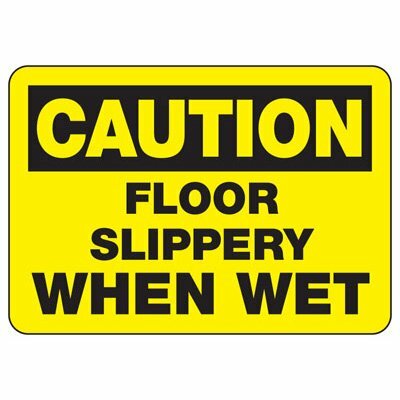 Whichever type you choose, slippery floor signs will definitely help prevent slips and falls in your facility. Update your floor stands message whenever needed! For a lot of facilities, slippery floors are a common workplace hazard. This is due to the fact that industrial fluids are necessary for a lot of facility processes. Some examples of industrial fluids are oil and other petroleum products, cutting fluid, ethylene glycol, deuterium oxide and water. For facilities that use these fluids, getting some on the floor can obviously create a slipping hazard. In fact, slips can occur even in the absence of liquids, as anyone who has slipped on loose sand on a smooth floor can attest to. 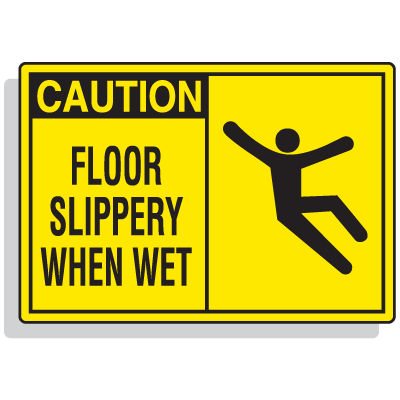 For both situations, a properly placed slippery floor sign can certainly help prevent slips and falls from occurring. According to the National Floor Safety Institute (NFSI), slips and falls are the primary cause of lost days from work. Lost days from work mean diminished production which in turn means lower revenues. Conversely, personnel taking days off work due to an accident means that personnel's capacity to earn is diminished. This just shows that a slip and fall accident impacts both a facilty's operation and that facility's personnel. 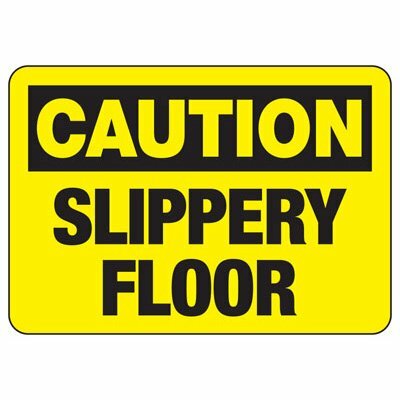 Slippery floor signs help prevent these accidents from occurring by warning personnel of a potential slip and fall hazard. Choose a sign with the proper OSHA header depending on how hazardous conditions may be. 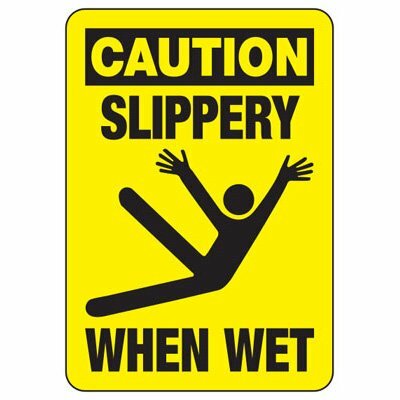 For example, for areas where slips that may result in same level falls, a sign with a Caution header may suffice. 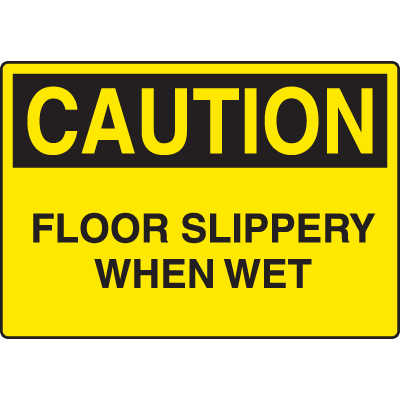 However, if a slip can result in a fall to a different level, such as along catwalks or stairs, use a sign with a Danger header may be needed.